(NewsUSA) - As back-to-school time sets in, personal finance becomes more complicated for many families. Some have students away from home for the first time, others have expenses for tuition, and of course the many purchases associated with the start of school: backpacks, lunch bags, clothes, books, dorm room furnishings, not to mention the tech gear - phones, tablets, laptops, and don't forget extra chargers. Banking and finance apps can help make life easier when it comes to tracking family finances and managing education expenses. When deciding on an app, look for features that provide flexibility, security, and ease of use. 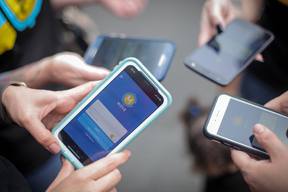 MovoCash is one example of a mobile finance company that offers a variety of financial options as alternatives to traditional banking services. A is for App: Does the mobile banking or finance company you are considering have a user-friendly app that allows secure spend and send functions from your phone? The free-to-download MOVO app offers FDIC-insured prepaid card accounts that allow customers to instantly pay friends and make purchases directly from their mobile phone. MOVO also offers MovoCoin, a feature that allows users to create instant digital prepaid cards in exact amounts for specific purchases. MovoCoin cards can be used for many charges, including paying bills, placing food orders, purchasing clothes, books, or other items online, or paying for ride-sharing services. B is for Banking: Mobile banking can be used for all aspects of financial management, including direct deposit and online bill paying, without the need for a traditional bank account. Look for apps such as the MOVO app that allow users to set up a direct deposit account to manage incoming paychecks and outgoing payments easily and securely. And timely payments help users avoid late fees and track expenses. C is for Compare: There are many financial apps out there. Use notable review websites such as Nerdwallet, The Balance and The Simple Dollar to help you compare financial apps and digital prepaid cards. For example, for families with students who are starting to manage their own finances, a banking app with the option of a prepaid card provides another layer of security and may help to prevent family friction associated with overzealous student spending. For more information about MOVO's full range of financial solutions, visit https://movo.cash.